[dropcap color=”#008040″ boxed=”yes” boxed_radius=”8px” class=”” id=””]I[/dropcap]s the Modi wave on the decline? A detailed post-mortem of the Bihar election result shows that the `so-called’ Modi wave that swept across the nation in the Lok Sabha polls, was not even half potent in the battle of Bihar. Prime Minister Narendra Modi addressed more than 30 hugely attended public meetings, broadcast live on nearly all TV channels, and was the main face of the BJP against Nitish Kumar since the party did not project any chief ministerial candidate. The party banked on the encouraging response to the PM’s rallies and hoped that the Modi factor alone will tilt the scales in favour of the BJP-led NDA against the Grand Alliance. After all, when leaders like Nitish Kumar and Lalu Prasad were drawing a modest crowd, ten of thousands of people were turning into the listen to Modi. The PM and the BJP managers took the crowd for granted. In several rallies, Modi did not fail to boast that the turnout was bigger than his Lok Sabha campaign rally at the same place. In his speeches, he mostly skipped his old promises of generating millions of jobs for the unemployed youth or changing the lives of the people by bringing back black money from abroad. He knew too well that people were not satisfied with the government’s performance on those two counts. So, he weaved new dreams and gave new hopes. [dropcap color=”#008040″ boxed=”yes” boxed_radius=”8px” class=”” id=””]U[/dropcap]ndoubtedly, Modi is a great orator, and he often mesmerised the crowd with his vision of Bihar. But somewhere down the line, Modi seemed to have lost his conviction that slogans of development will fetch him votes. He must have read something on the faces and in the gesture of the people who came to his rallies to feel that his words and promises did not carry conviction with the masses. After all, much of what he had promised in the Lok Sabha polls, was yet to be delivered. The development plank was put on the backburner and Modi unleashed a personal attack on Nitish Kumar and Lalu Prasad. As if this was not enough, he also got swayed by the hysteria created by the “beef brigade” of his party and seemed to have endorsed brazenly communal advertisement put up by the BJP in local newspapers. In the process, Modi ended up sending a confusing and conflicting message to the voters, often appearing like a man who was not sure of his words. [dropcap color=”#008040″ boxed=”yes” boxed_radius=”8px” class=”” id=””]A[/dropcap] large section of people who often talked about rising prices of pulses and edible oil to mock at Modi’s claims of ‘acche din’ were disillusioned. They came, they saw, and they listened to Modi, but they ignored his appeal to vote for his party. The skepticism was so high that in as many as 13 Lok Sabha constituencies comprising around 100 seats, the BJP did not even open its accounts. The PM may have held one of his biggest rallies in Bhagalpur, but the party did not win even one of the seven seats there. Modi addressed a rally in upper caste dominated Naubatpur under Bikram constituency at the outskirts of Patna, but his party candidate lost by 40,000 votes. It was obvious that even the upper castes were not swayed by Modi’s magic. As pointed by us in the past, the PM got overexposed in Bihar and, as a result, the so-called Modi wave lost its bite. 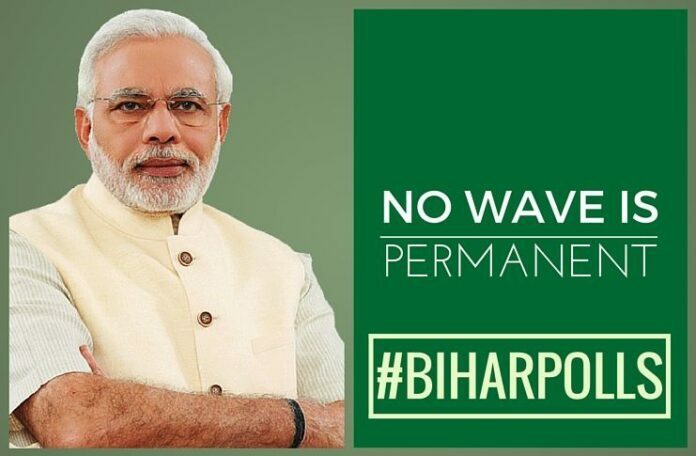 In the debacle of Bihar, there is a lesson for Modi and the BJP: No wave is permanent.